Raising the “Morning Star” flag is high-risk in West Papua. On December 1, Independence Day, a new tactic emerged in the territory’s 47 year long struggle for independence. Small groups of Papuans still raised the banned Morning Star flag. The Indonesian security forces still responded with characteristic overreaction. But this year Forum Demokrasi (ForDem), the same group that organised the July 8-9 2010 occupation of the Provincial Parliament, did something different. Despite the fact that the Indonesian constitution theoretically supports freedom of expression and that the flag-raisings are nonviolent, raising the Morning Star Flag is still high risk. Agence France Presse reports that in the lead-up to December 1, police arrested and beat up eight unarmed civilians (one woman and seven men) who raised the flag in the highlands. According to a doctor working at the hospital in Wamena, one of the eight later died as a result of injuries sustained in police custody. Then, on the day, police from Kapolres Jayawijaya (the regional police command in the central highlands) and soldiers from Kodim 1702 (the Wamena based regional military command) raided the small village of Bolakme where the previous flag raising took place and shot dead two Papuans, Asli Wenda and Elius Tabuni. The police are trained by the United States, New Zealand, and Australia. The military are also trained and armed by the United States and Australia. Flag-raisings concentrate people in one place. Participants and organisers are routinely arrested and charged with rebellion, subversion and hate-sowing against the State, charges that date back to the colonial Dutch era. The antiquated criminal code, promulgated by the former Indonesian dictator Suharto in order to repress dissent, would be anathema in Indonesia’s new democratic era. The absence of free speech highlights the fact that Indonesian is one country with two systems: democracy in the rest of Indonesia, and semi-authoritarian rule in West Papua. In contrast the ‘dressed in black’ action was dispersed. It was something Papuans could do wherever they lived. 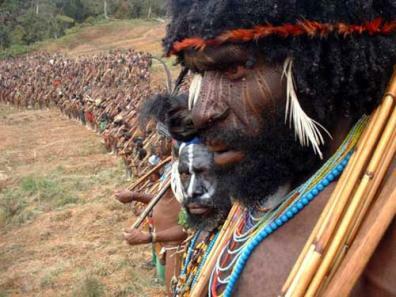 Consequently it is lower risk, supports greater participation by ordinary people and could proceed for longer – Papuans wore black for the whole first week of December. ForDem’s (Leadership pictured left: see caption) inspiration is Mkhuseli Jack and his colleagues’ anti-apartheid United Democratic Front in South Africa, the U.S civil rights struggle, and other nonviolent struggles around the world – particular those led by Black and indigenous populations in resistance. ForDem also draws on the long history of unarmed resistance inside West Papua to animate civilian mobilisation. ForDem hopes to maximise the participation of Papuans in a mass civilian-based movement that systematically uses nonviolent action to achieve tangible victories on a path toward greater freedom. Jason MacLeod is a researcher/trainer at the Australia Centre for Peace and Conflict Studies in Brisbane, Australia.